Roundhouse Rising Festival closes with a night of carnival vibes featuring Kuenta i Tambu, Auclair, The Roundhouse Choir and Nouria Bah. 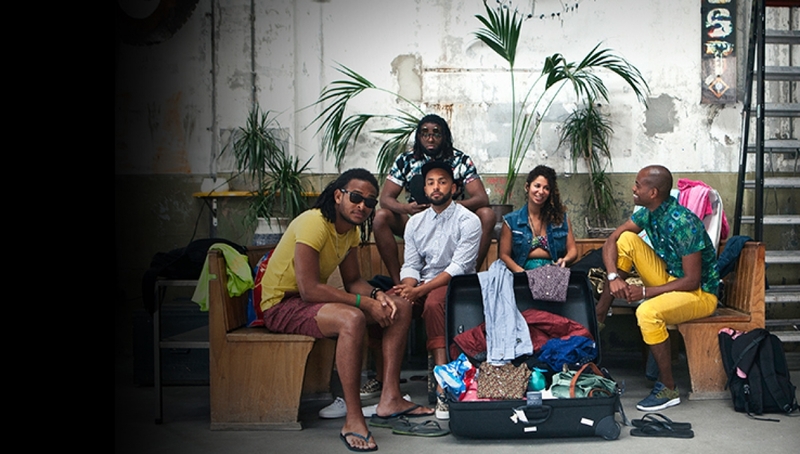 Kuenta i Tambu have transformed the old tambú music of Curaçao into the 21st century phenomenon of Tambutronic. Then-meets-now through hard kicks and hooky synths, the gritty good times that spawned bass music’s tropical, global offshoots, from baile funk to moombahton. Taking up the sounds that evolved in Dutch clubs and mashing them effortlessly with the group’s percussive, evocative Caribbean roots, Kuenta i Tambu proves how easily traditional grooves can move in new, unexpected ways. Live, they are a non-stop Carnival, a riot of beats and rhythms that take the audience deep into the Caribbean. Auclair and Roundhouse Choir have been working on a very special collaboration for Rising 2016. This one-off show will see them perform choral reworks of Auclair’s songs and premiere a brand new piece they developed together called In Waves. Nouria Bah grew up in Maryland, USA and has been living in London for the past four years. She creates homemade groove and vocal-driven music featuring various samples which has been described as “acoustic jazzy folk hop”. In addition to performing across London, Nouria works with other projects including Lina Lapeylte’s Candy Shop Opera and the 2015 Roundhouse Music Collective.